Identification: Four fire ant species are found in Texas. Three are native. The imported fire ant has just about wiped out the natives. The imported fire ant builds its mounds out in the open. Mounds have no visible openings. Stings are painful and sometimes produce a unique white pustule. Biology and life cycle: Colonies consist of the brood and several types of adults: winged males, winged females, one or more queens, and workers (which are wingless). The brood is made up of cream-colored eggs, larvae, and pupae. The reproductive winged forms are most prevalent in spring and summer. Mating flights usually happen between April and June. Males die after mating. A queen in a large colony is capable of producing her own weight in eggs every day (1,500 to 2,000). A typical mature fire ant colony will contain 80,000 workers, but some mounds contain as many as 240,000 workers. There can be anywhere from 20 to 500 or more queens per mound. One giant mound was discovered that contained 3,000 queens. Queens can live five years or more. Complete metamorphosis. Habitat: Almost any soil but mainly open, sunny areas such as pastures, parks, lawns, meadows, and cultivated fields. Will also infest the vegetable garden. They love eggplant, okra, cabbage, and broccoli. Feeding habits: Omnivorous, will feed on almost any animal or plant. They eat other insects, oils, sugars, and young seedlings and saplings. Economic importance: Tremendous economic problem due to electrical device damage. They also kill baby animals. They do have a beneficial side, however. They eat ticks, chiggers, termites, boll weevils, flea hoppers, cotton bollworms, pink bollworms, tobacco budworms, pecan weevils, hickory shuckworms, flies, fleas, cockroaches, and corn earworms. They are a beneficial predator in controlled numbers. Natural control: Lizards, birds, other insects, and microorganisms. Organic control: Beneficial nematodes, and diatomaceous earth. Beneficial microorganisms in the compost tea and in the gut of nematodes seem to be doing the actual control. Laboratory tests have shown that the beneficial fungus Beauvaria bassiana is effective against fire ants. Diatomaceous earth on dry days or mixture of compost tea, molasses, and citrus oil any time. Many gardeners report good results with instant grits and other instant breakfast cereals. Spraying products that contain molasses helps keep them away. Applying ground-up orange and grapefruit rinds to the mounds is another excellent control. Insight: Research on a parasitic fly from Brazil is being done at the University of Texas at Austin by Dr. Larry Gilbert. It's the native natural control. Texas A&M has also been studying a flylike parasite, Caenocholax fenyesi. Spencer Johnson, an entomologist, discovered it while dissecting fire ants. Photo shows a mound treated with Andro - a procedure I do not recommend. Before the chemical pushers started throwing Diazinon, Dursban, Myrex and Orthene at these insects, they weren’t much of a problem. The queens were territorial, there was only one queen per mound and there were very few mounds per acre. After the toxic chemical assault, the ants altered their behavior so that there are hundreds to thousands of queens per mound and large numbers of mounds per acre – except on organic sites. Here's the 3-Step organic program that actually works to control this man-made problem. 1. Treat the site. Apply beneficial nematodes. These are living organisms and must be used before the expiration date on the package. These are best for high viability areas. They will also control other insect pests or apply dry molasess at 20lbs per 1000 sq. ft.
2. Drench mounds with the mound drench formula. The concentrate is 1/3 orange oil, 1/3 liquid molasses, and 1/3 compost tea. Mix 4-6 oz. of the concentrate per gallon of water and pour straight into the center of mounds. It doesn't repel, it kills. Commercial products are available. During dry weather, dust mounds with diatomaceous earth. This is especially good for indoor infestations. 3. Go organic and use the entire basic program. The biodiversity of microbes, insects and other animals is the long term control. The best first step is to broadcast dry molasses at 20 lbs. per 1000 sq. ft. which also gives organic fertility to the soil. Dry molasses can also be used to spot treat problem areas. Fire ant explosion after organic treatment. It’s important to understand that first the fire ant issue is a man-made problem. 1. Increase biodiversity. Fire ants are more of a problem in new neighborhoods than in older neighborhoods, where there is a more stabilized ecosystem. When fire ants are forced to compete they become less of a problem. We must do our part to encourage nature. 2. Treating the lawn spring and fall with nematodes. Treat after sunset and follow-up with ½ inch of irrigation. Nematodes are live microscopic worms and need to be applied at the highest recommended rate and in a manor to ensure their survival. 3. Treat individual mounds with 1-1/2 ounces of citrus and a few drops of soap as a wetting agent per gallon of water. Treat each mound with one gallon of diluted mixture. 4. 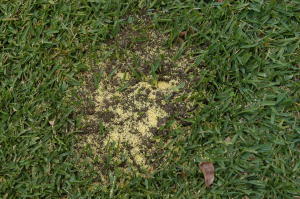 When large areas have bad infestations of fire ants, the next step up from the nematodes and citrus drench is applying baits on the whole property at 1-1/2 lb. per acre and one teaspoon of bait per mound. The baits we recommend are the ones containing abamectin because it is derived from a soil microorganism. At low concentrations abamectin acts as an insect growth regulator and when used on individual mounds it is a stomach poison. 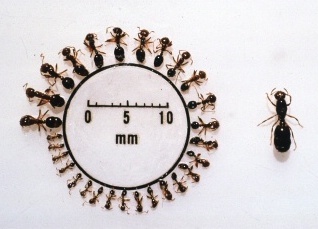 Baiting should be done in the spring and fall during times of active ant foraging. Test the timing and the bait’s palpability by applying a small amount to individual mounds and watch for a quick uptake. For mounds along sidewalks, house foundations etc. 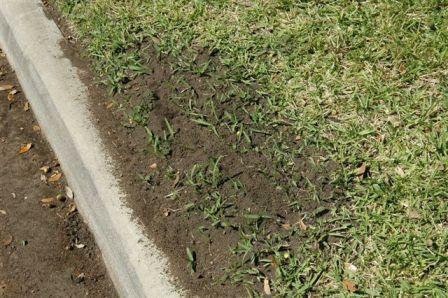 bait is normally required to get effective control, because the ant colony is protected under the concrete. 5. The next step up from the abamectin baits is the chemical growth regulators. These products do not kill ants, they obstruct their life cycle. This process is slow and should be looked at as a low toxic method to decreasing fire ant populations on large properties over a period of several months. Extinguish is a product that has demonstrated good results. As with most baits it is best used in the spring and fall when ants are actively foraging. Pour the mound drench formula into the center of the viable mounds and apply beneficial nematodes at label directions. Here's the mound drench formula. Mix equal amounts of compost tea, molasses and orange oil. Use 4-6 ounces of this concentrate per gallon of water and use as a drench to kill fire ants and other pests in the ground. Use a container that pours a solid stream of liquid. Pour into one spot in the center of the mound. This causes the mix to go quickly to the bottom of the mound where the queens will probably be kept. Then pour the remainder of the mix in a circular pattern covering the entire mound. You might want to save a little to splash those ants trying to run away or worse, up your legs.